MIDNIGHT IN PEKING WINS A DAGGER! 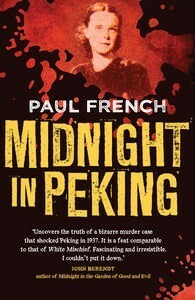 Paul French’s MIDNIGHT IN PEKING (Penguin Australia) wins the prestigious UK-based Crime Writers’ Association Non-Fiction Dagger: http://www.thecwa.co.uk/daggers/2013/non.html. MIDNIGHT IN PEKING will be published in France by éditions Belfond. Previous Post READING IS HIGHLY ADDICTIVE!